Dylan has always loved animals and over the past year his love has become more of a way of life. He would rather watch documentaries about animals than cartoons and has been collecting animal reference books since before he could even read. Adopting animals is second nature to him and he wants to be a zookeeper when he grows up. Knowing this about him, it should not have surprised me when he told me what he wanted for his 9th birthday - yet what he said took my breath away and was probably the proudest moment in my life as his mother. On a recent visit to the San Diego Zoo Safari Park for Endangered Species Day, we had the opportunity to meet Joan Embery and hear her speak about the wonderful conservation efforts that have been made over the past 40 years. Dylan listened so intently to every word said. I do believe he stopped breathing for a moment when she announced that an anonymous donation was being made to the new Tiger Trail in the amount of $9 million. However, there was a catch. They must raise $2 million by the end of 2012 to get the $9 million. He turned to me and said, "Mom, I want to help too"
At this moment there was no doubt in my mind that he was sincere. After reading about the new Tiger Trail and seeing sketches of what the exhibit would look like when completed, it was time to start planning. When Dylan learned that making a $1,000 donation would allow him to have his name inscribed along with other Tiger Trail Sponsors on a recognition plaque at the entrance to the new exhibit his eyes lit up. Wow! Did this just come out of an 8-year old child's mouth? I told him if he was going to ask people for donations to help him reach his goal that they would want to know why this was so important to him. So I asked him a few questions. Why do you want to help build Tiger Trail? "Because the tigers need a safe home to live. They can't do anything about the poachers who want to kill them in the wild. Tiger Trail will give them more freedom and more room to play and interact with others." What will it mean to you to have your name inscribed on a plaque at the new exhibit? "Everything! It will mean everything to me. It will make me very, very happy and proud because it means that I helped the tigers and made a difference in their lives." So there you have it. Dylan's birthday wish is to donate $1,000 to Tiger Trail. I contacted the Zoological Society of San Diego to see what could be done. An honorarium has been established in Dylan's name and all donations made through this link, with the information entered as explained below, will be credited to him. 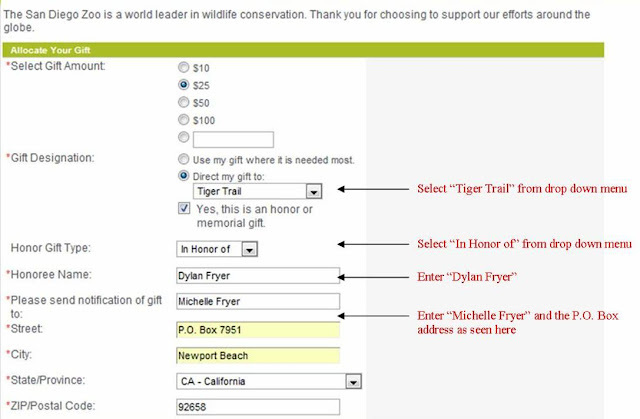 By selecting Dylan Fryer as the honoree and making a donation through this link, you will be helping Dylan and the tigers, plus your donation to the Zoological Society of San Diego is tax-deductible. 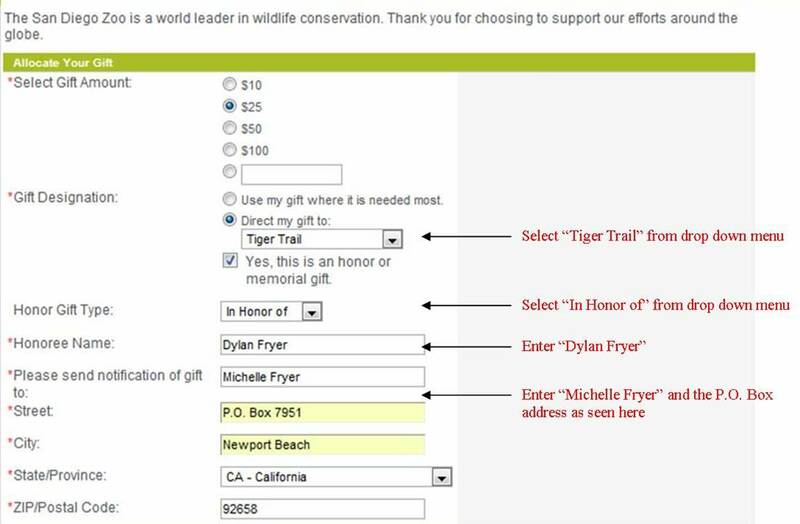 Dylan will only receive credit for your donation if his name is entered as the honoree and Tiger Trail is selected as the gift designation. Here is a screen shot of the donation page with instructions for the Honorary donation. Dylan's birthday is in July and his goal is to raise the $1,000 by July 31st. As a special thank you, Dylan will be sending a set of tiger note cards (handmade from pictures I took of the tigers at the San Diego Zoo) to everyone who donates $25 or more. Thank you for helping make a birthday wish come true for Dylan and for the Tigers of the San Diego Zoo Safari Park. I would like give special thanks to Liane, from the Zoological Society of San Diego, for all of her help in setting up the donations and tracking the donations made in Dylan's honor. Dylan's story appeared on the front page of the Newport Beach Independent on June 22, 2012. What a great kid! I'm going to donate now! I saw this on twitter via @sdzsafaripark. Thanks for reminding me, I wanted to donate anyway and even better to make a birthday wish come true. Happy Birthday Dylan! You'll have to keep us updated on his progress!